Rabbi Todd and his family moved to Cedar Rapids in 2009 to become our rabbi. Having grown up in Kansas City, Rabbi Todd was happy to return to the Midwest after 10 years as a rabbi in Houston. He is a graduate of the University of Colorado and received his ordination from the Hebrew Union College – Jewish Institute of Religion, in 1999. 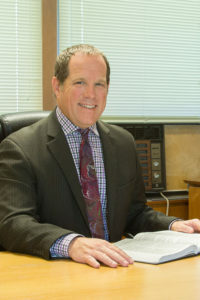 In addition to his work for the congregation, he is also the current president of both the Inter-Religious Council of Linn County and the Midwest Association of Reform Rabbis. His wife, Sabrina, is a nurse, and their children, Noah and Gabriella, are both in college. When not working, he enjoys movies, sci-fi, concerts, and golf. To read Rabbi Todd’s monthly column, click on the link in the sidebar. 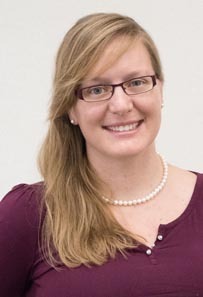 After graduating from Purdue University, Jillian Diner moved to Cedar Rapids in 2011 to accept a full-time position as an engineer at Rockwell Collins. There she met her future husband, Joe. She converted to Judaism, and they were married at Palisades-Kepler State Park by Rabbi Todd Thalblum. Jill became more involved with Temple Judah by volunteering, attending board meetings, and coordinating the new website. After serving as 1st Vice-President, she was elected to serve her current two-year term as President, which started in the summer of 2017. She and Joe have a toddler son, Max. When she’s not working, Jill enjoys spending time with her family outdoors, hiking, and crafting. To read the President’s column, click on the link in the sidebar. Carolyn, originally from St. Louis, moved to Cedar Rapids in 1993 after living in the Washington, DC area and Columbus, Ohio. Carolyn’s son, Daniel, who is now grown and on his own, grew up in Cedar Rapids and was active at Temple Judah. 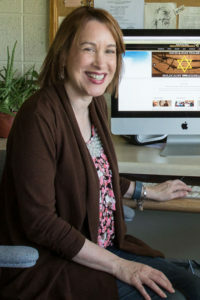 After serving as Temple Judah’s Co-Administrator of Religious School for 13 years, Carolyn became Temple Judah’s Secretary/Administrator in 2007. In her spare time, Carolyn enjoys reading, improving her knitting skills and baking for friends and family. You can contact Carolyn during her office hours, from 12:30 to 5:30 pm at 319-362-1261 or by using the contact form below.